Twenty-four camping sites with full service including water, sewer, 30 or 50 amp power and all weather pads. These sites also come with a large grassy area behind the site. 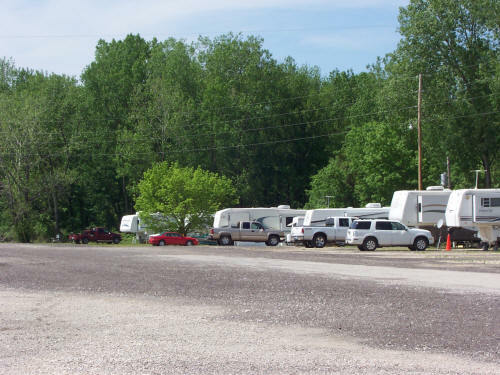 These sites can be utilized for either tent or RV camping. Each site comes with a fire ring and a picnic table as well. We also have Wi-Fi throughout the marina and campground, a swimming pool, and a wonderful shower suite facility! We have recently added two cabins that are available for rental. Each cabin can sleep up to six people. The cabins have a queen bunk bed arrangement with a TV and DVD player (There is no cable in the cabins), small fridge, microwave, coffee maker, sink, full bathroom, air conditioned and heated. Each cabin comes with a fire ring and a picnic table as well. We also have Wi-Fi throughout the marina and campground, a swimming pool, and a wonderful shower suite facility! There is a $20.00 deposit on key cards which allows access to the shower house and pool as well as the security gate which is at the entrance of the marina. The deposit is completely refundable as long as the key card is returned.